Animal nutrition is developing with the growing meat and milk market. Animal feed manufacturers tend to attain more output from animals when nutritious ingredients are used in animal feed. This report covers the five major applications of bioactive ingredients mentioned above: functional food, functional beverages, dietary supplements, animal nutrition, and personal care. The global bioactive ingredients market is projected to reach $33.6 billion by the year 2018. The different types of bioactive ingredients covered in this study are prebiotics, probiotics, amino acids, peptides & proteins, phytochemicals & plant extracts, Omega 3 & structured lipids, fibers & specialty carbohydrates, vitamins, proteins, carotenoids & antioxidants, and others. The major regions that are considered for the study are North America, Europe, Asia-Pacific and Rest of the World. Asia-Pacific forms the dominant market with the highest share and CAGR. The overall bioactive ingredients market is expected to experience a growth rate of 7.2% from 2013 to 2018, whereas the Asia-Pacific region is expected to grow at a rate of 7.4% for the same period. This report classifies and defines the bioactive ingredients market value in the overall bioactive industry. It also includes qualitative and technical data pertaining to bioactive ingredients such as sub-types, source, application, etc. The report also provides a comprehensive review of market drivers, restraints, opportunities, and key issues in the bioactive ingredients industry. The major players in the bioactive ingredients market have also been identified and profiled. The major players include DuPont (U.S.A), Royal DSM (Netherlands), Cargill (U.S.A), ADM (U.S.), and BASF (Germany). The global bioactive ingredients market has been analyzed in terms of value on the basis of the classifications mentioned below. The aging population and an increasing number of chronic diseases generate health concerns in the consumers’ minds, which are major factors that push the bioactive ingredients market. Consumers are shifting their eating habits from hunger-satisfaction to the intake of healthy food in order to either fulfill the nutrient deficiency in the body or to prevent the deficiency of major nutrients. The concept of bioactive is modern and still seeks opportunities in several parts of the world. However, the growth prospects of this industry are extremely high in the future due to the involvement of various herbal ingredients that tend to gain the consumers’ trust in developing nations. The role of bioactive ingredients is incredibly significant in the overall industry, as the quality of ingredients used in a product directly affects the market for that product. Although both the industries are interdependent on each other, the impact of the ingredient industry is higher on the product industry. The major applications for bioactive ingredients include functional foods, functional beverages, dietary supplements, animal nutrition, and personal care. 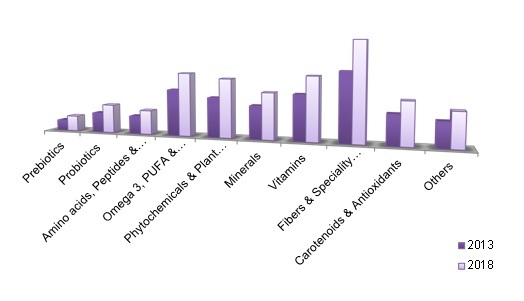 According to this analysis and study by MarketsandMarkets, the five categories mentioned above are the most widespread applications of bioactive ingredients. The overall industry of food and beverages has not been taken into consideration as functional food and beverages in their basic functions are different from regular food and beverages. Dietary supplements are taken as a part of pharmaceuticals as the products are served in the forms of capsules, tablets, powders, and liquids that supplement certain nutrients that the diet of a person is deficient in. Animal nutrition is gaining significance with increasing concentration on the diet served to animals with the growing meat and meat products industry. Another reason is the growth of the milk industry that pushes the manufacturers to provide animals with quality food. Personal care is an emerging application in the bioactive ingredients industry. It is technically termed as cosmeceuticals, which involves healthy and nutritious ingredients to treat skin, hair, etc. On the basis of geography, the bioactive ingredients market is segmented into North America, Europe, Asia-Pacific and ROW. Asia-Pacific has proven to be the dominant market with largest market share and highest growth rate for the next five years. 20.4 Dupont DENemours & Co. (Dupont) Msds.